The Spring cleaner is an item I use a lot and make a lot of cash from, it can be confusing to set up and understand how to use it so here are some words and pictures to help you! 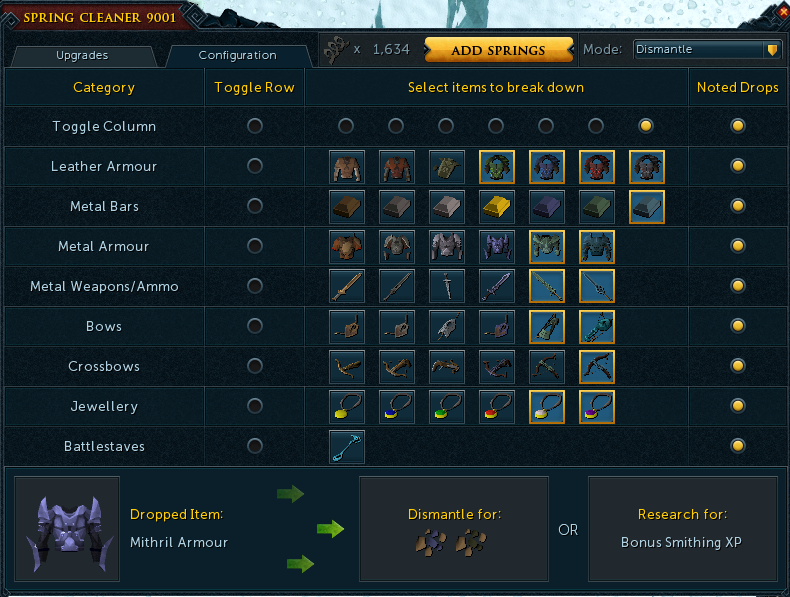 Answer is yes you want the max upgraded version to Spring cleaner 9001 as it dismantles noted drops too then and you can get it instantly by buying springs on GE but its expensive (10K springs needed!) so don’t worry if not – Start using it anyway and it will upgrade as you go. AHHHH WHAT DO I DO WITH IT, THERE ARE TOO MANY SETTINGS? Don’t panic – All you need to do is set it up first time and then just take it with you on slayer tasks or even to boss kills and it will start dismantling stuff and sending the ore etc to your bank (so saves picking stuff up too! ).